Optoma has a history of making affordable home theater projectors that pack a punch. 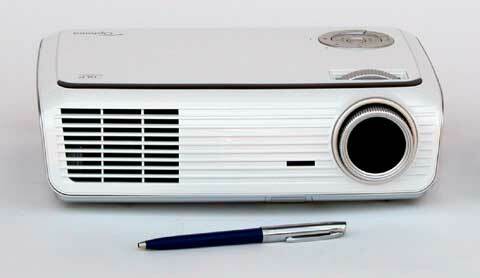 In 2006, the Optoma HD70 made the dream of 720p home theater for $999 a reality. This year, the Optoma HD65 takes up the reins, and proves to be a powerful, worthwhile addition to Optoma's budget 720p line. This light, bright 720p DLP projector is both portable and powerful, making it easy to use almost anywhere. The HD65 makes some improvements to the already solid performance of the HD70, and sells for $999. High lumen output. We measured the HD65 at a maximum of 1152 ANSI lumens, using "Bright" mode with the lamp on high. This setting makes the HD65 particularly useful for HD sports, video games, and other "social" content. Many folks do not have the means or inclination to darken an area of their house for theater use. Projectors like the HD65 allow those users to bring the theater experience into their living rooms without drastically altering their decor. The HD65's lumen output is also highly variable. For many people with more traditional home theaters, 1152 ANSI lumens is simply too much light. In these cases, the HD65 can be switched to low lamp mode, which will lower lumen output by roughly 11%. Further reduction can be accomplished by switching image modes or reducing the projector's BrilliantColor setting. Turning off BrilliantColor completely can decrease the projector's lumen output by 43%, and the projector uses a ten-step scale for adjustment so there are plenty of settings to choose from. That said, the minimum lumen output we measured from the HD65 was 419 lumens, in Cinema mode with the lamp on low power. That is a remarkable amount of light for a minimum reading. Highly portable. Measuring 10.2" by 7.4" by 2.9" and weighing only four pounds, the HD65 is easy to transport and store. After use, it can be stowed in a carrying case, hall closet, or even in a drawer. It is small enough to pack with your game system for transport to someone else's home. In a projector bright enough to use almost anywhere in the home, portability is a big plus. Good color performance. With the older HD70, we noticed some artifacts related to the projector's color processing, which we did not experience when using the newer HD65. Color gradients were smooth and even, without the rough transitions of the older model. These improvements are most visible when there is a gradient on the screen, such as the flesh tones in faces or a solid color field, such as the bright colors used in many video games. In these situations, there is a clear and appreciable difference between the two projectors with regards to color transitions. Good remote layout and backlighting. The remote control is the usual Optoma design, wide on both ends and pinched slightly in the middle, with rounded corners. The buttons are relatively large ovals, with textual labels printed on the buttons themselves. The backlight is a brilliant blue which some might consider too bright, as blue LED lights on electronics tend to be. However, it does make reading the buttons on the remote very easy, even in a blacked out room.